The redemption of Nestlé LACTOKID 550gm pack and height chart is open to parents with kids aged 1 – 3 years old. Parentis required to PM (Private Message) the following details (Name as per MYKAD,MYKAD Number, Mailing Address, Mobile Number & Email address) to NestléJunior Club Facebook Page to be qualified for the redemption. 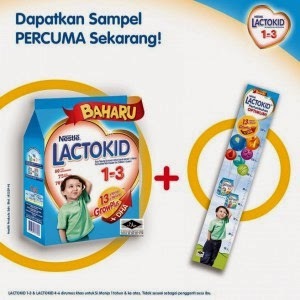 First 500 requesters will get ONE packet of Nestlé LACTOKID 550gm pack and ONE HeightChart. Subsequent 1,500 requests will only receive ONE Height Chart. Requesteditem(s) will be sent to registered mailing address.